. : Optics & Photonics Focus :: Why We Should All Care about Science Writing :. The mass media are considered the most available and sometimes the only source for most of the public to gain information about scientific discoveries, controversies, events, and the work of scientists. Science reporters play a crucial role in developing a public that is literate about science so that people are able to make wise choices about issues with scientific underpinnings and become active participants in defining policy options. A problem demanding a solution. One of the major limiting factors in crop production in Asia is the heavy infestation of the corn borer, Ostrinia furnacalis, yielding a 30-40% reduction of productivity. This pest already limits the food production in several asiatic countries and has a significant impact on the development of the region. There is substantial agreement in the academic community that the levels of scientific literacy among the general public are undesirably low for our technologically driven society. A list of studies indicates that people are generally not well informed about most scientific issues, even those that are prominent and long-standing. Hazen in 2002 estimated the number of scientifically literate Americans as fewer than 7% of adults, 22% of college graduates, and 26% of those with graduate degrees. Today, it is imperative to be literate about science not just for personal improvement or to gain perspective on the intellectual climate of our time. Everyone in modern democratic societies has the responsibility and the right to participate and make decisions regarding issues with scientific underpinnings in the local community and those that affect the entire planet. For example, reducing greenhouse gas emissions to mitigate adverse climatic impacts is an undertaking that should involve every citizen in every nation of the world. Proper actions to achieve this demand a citizenry that is knowledgeable enough about basic science concepts, principles and processes to make wise choices. After all, the level of people’s support for scientific and technological undertakings determines, to a large extent, the nature and amount of public spending for research and development. Thus, a public that is literate about science can result in a range of outcomes, including motivating greater interests and concern, influencing political or personal behavior, and defining policy choices or options. The mass media are considered the most available and sometimes the only source for most of the public to gain information about scientific discoveries, controversies, and events, and the work of scientists after formal science education ends. How ordinary citizens come to understand a new technology, a scientific event or a science-related policy issue depends, at least in part, on how the issue is covered by the media. Scholars have found that massive media coverage, independent of content, influences public perceptions of the seriousness of events with strong scientific bases as well as the political agenda of social groups and institutions involved in these issues. In other words, the sheer volume of reporting alone arouses public attention. Others contend that filtering effects, deleting and adding information, changing the order of message presentation as well as the context, have a profound influence on public perceptions of scientific topics. It is no surprise, therefore, that many studies have provided evidence that the media, whether providing warning or reassuring messages, can extensively frame discourse, shape public perception, and determine how problems are socially constructed. The extent to which science issues now affect public life seems antithetical to the decline of science in the news. Many attribute this to an under appreciation of the value of science as a news topic. It may also be the result of an overall downward trend in newspaper readership and network news viewership, and demographic changes in the audience for these media. The shrinking size and the aging of audiences who use these media led to fewer pages and few on-air minutes devoted to news of any kind. On the bright side, the public is very interested in learning about the practical applications of science. The percentage of people who follow health news very closely trails only the percentage who follow crime and community news. The reason that health and medical news is so popular is that it directly affects people. In other words, the works of wildlife ecologists, astrophysicists and oceanographers will be interesting to audiences as long as people find these works relevant to their lives. It suggests that although scientists may not be able to change the culture of the mass media, they can help improve the way science is covered. Genetically modified corn ears are less affected by the pest. 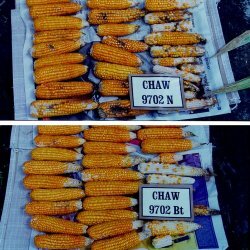 While the original corn (top) is greatly affected, the genetically modified version (bottom) is essentially unharmed by this pest. 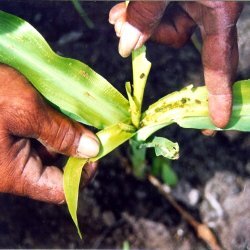 The genetically modified corn contains a gene from a naturally occurring soil bacterium, which leads to a specific protein which kills target insects such as the corn borer and other pests. Indeed, casual conversations with scientists reveal a certain sense of trepidation on the prospect of getting interviewed by yet another reporter. The results of disparate studies science reporting may point to some of the reasons behind this apprehension. Communication researchers have found evidence to support the allegations that journalists (1) make science more certain that it is, (2) tend to transform provisional findings into certain findings by eliminating caveats or omitting qualifiers to scientific results, (3) neglect historical context, failing to indicate, for example, whether a new study departs from or extends prior research, and (4) are more interested in the carefully crafted results that scientists produce rather than in the messy interpretive and often social processes by which they are produced. There are times when journalists are lambasted for making science appear more uncertain and baffling than it may be. Many have observed that reporters tend to give equal weight to majority and fringe scientists, and to scientists and non-scientists. Given these findings, it is tempting to make the categorical statement that journalists distort science by doing what they do. 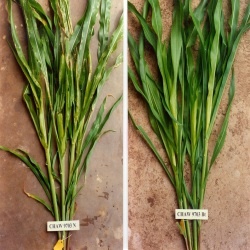 Genetically modified corn leaves are not affected by the pest. The pest problem can be solved by genetic manipulation, as this side-by-side comparison shows. 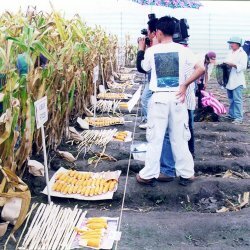 The benefit/risk assessment, however, has to be made by the informed public, as the decision for or against the use of genetically modified crops affects everybody. Many lament, for example, that the media’s coverage of scientific and technological issues have looked more intensively at the products rather than at the process of story construction. Two patterns are often detected. The first is that media coverage of science does not mirror reality, as defined by the researcher. The second is that stories contain very little information, as defined by science. These patterns result, many say, because science reporters lack systematic knowledge about the scientific culture and how people go about making personal judgments about what to do when confronted with topics with scientific and technological underpinnings. Many reporters lack the ability to present complex technical material that is clouded by uncertainty and inherently difficult to understand. In the subsequent days and weeks, scores of stories on the research were published and broadcast by many of the world’s major newspaper and broadcast outlets, including National Public Radio, the New York Times, the Washington Post, the Los Angels Times, and the San Jose Mercury News. The headlines of many of these reports erroneously misstated the conclusions of the paper. A typical example was one that stated, “Dire warming warning for earth’s species—25 percent could vanish by 2050 as the planet heats up, study says.” In fact, the original scientific paper did not actually say that even a single species would be extinct by 2050. Reporters disseminate scientific information. Science reporters face the daunting task of explaining the complicated process and rationale, as well as the benefits and potential risks of genetic engineering to a wide range of audiences. Due to the complexity of this task, however, not only reporters but also scientists and the general public need to make an effort to share their insight, in order to take informed decisions. Their professional routines (i.e., their adherence to balanced reports) and organizational demands for novelty and significance aside, one cannot help but empathize with the reporter who has to deal with the barrage of scientific claims and counterclaims increasingly becoming inherent in today’s scientific issues. The complexity of scientific data and assertions from competing camps make it apparent that for every Ph.D., there is an equal an opposite Ph.D. It’s up to the reporter to make judgments about who is credible and who to ignore. So how does journalists deal with incessant claims and counterclaims? If you listen to the critics, the answer is about as well as Southerners deal with blizzards — which is to say, with a lot of slipping and sliding, and sometimes falling on their behinds. The making of a science story is indeed a complex task. Any singly story is the product of a complicated dance among several actors, each trying to cast the story in ways that make sense to them. Complicating matters further is the fact that meaning is only partly under the control of these storytellers. At the receiving end waits an audience capable of interpreting the message in sometimes unexpected ways. Equipped with a formidable array of interpretative frameworks, readers and viewers are likely to construct story meanings that fit their own perceptions as easily as they wear a favorite sweater. Not too long ago, scientists and journalist held each other at arm’s length. The relationships between the two groups have foundered regularly on rocky shores. Although some may see the picture as virtually unchanged today, something of a revolution in this basic relationship is under way. Scientists are increasingly recognizing the value of public visibility. Journalists have always needed the information that scientists provide. Because of this, scientists understand better how reporters work and how to participate in the construction of popular images of science and their meaning. This leads to a shared culture of sorts in which both groups understand each other’s demands, the significance of each other’s work, and the ethics of both professions. Lulu Rodriguez is professor of journalism and communication and director of graduate education at Iowa State University (USA). She has worked as science and development communication consultant for the World Bank and the U.S. Agency for International Development in East and Southeast Asia, and as science information officer of the Philippine government body in charge of agriculture and natural resources, research and development. Today, her research focuses on visual, science and risk communication, for example in the context of harnessing biotechnology for Africa, quantitative testing of cultural theories of risk, media coverage of biotechnology in the developing world, and the visualization of risk.